Review Summary: On the whole there's tremendous curiosity and anxiety to watch the sequel of VAASTAV. 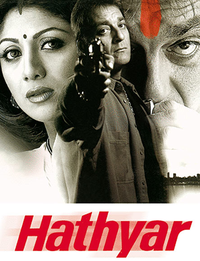 Violence is the way of life in Mahesh Manjrekar's Hathyar, a sequel to his 1999 hit Vaastav (which, like Hathyar was also released in the second week of October in 1999). On the whole there's tremendous curiosity and anxiety to watch the sequel of VAASTAV. There's trouble in the infernal paradise known as Mumbai's underworld. Filmmakers of every possible creative compulsion are looking aghast at the internecine violence of the gangsters. More than often, sequels to hit films rarely live up to expectations.